Enter WA14 5NQ into your satnav and follow the directions. 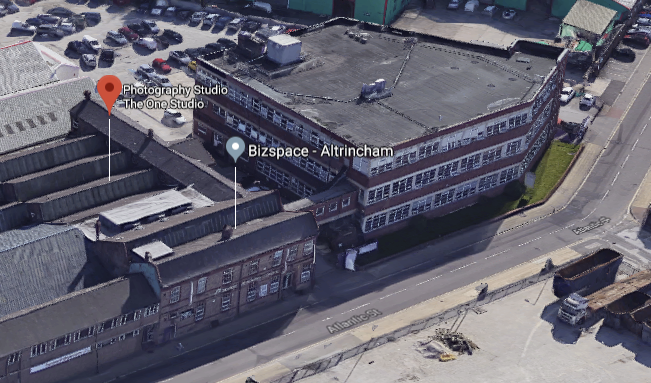 The One Studio is located in Unit 54, Biz-Space, Altrincham. You will need to drive out of Manchester on the A56 toward Altrincham. You will pass RRG Toyota on the right. Keep going straight. At the third set of traffic lights, turn right onto George Richardson Way. You will see Broadheath Retail Park on the right (Homebase, Currys etc). As you go around the bend, Bizspace-Altrincham is on the left. You can take either the first or second gate to access the rear car park. Call us and we will come and meet you in reception. Enter WA14 5NQ into your satnav and follow the directions. The One Studio is located in Unit 54, Biz-Space, Atlantic Street, Altrincham. You will need to drive out of Manchester on the A5103 toward Manchester Airport. Turn left onto the A56 - RRG Toyota is on the opposite left.